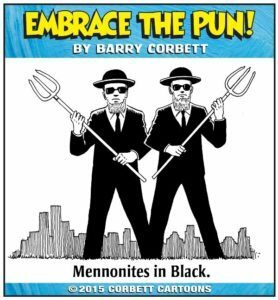 Barry Corbett–freelance magazine cartoonist and self-published author of six trade paperbacks and three comic books–enjoys creating numerous works of side-tickling humor from his Beverly, Massachusetts studio. 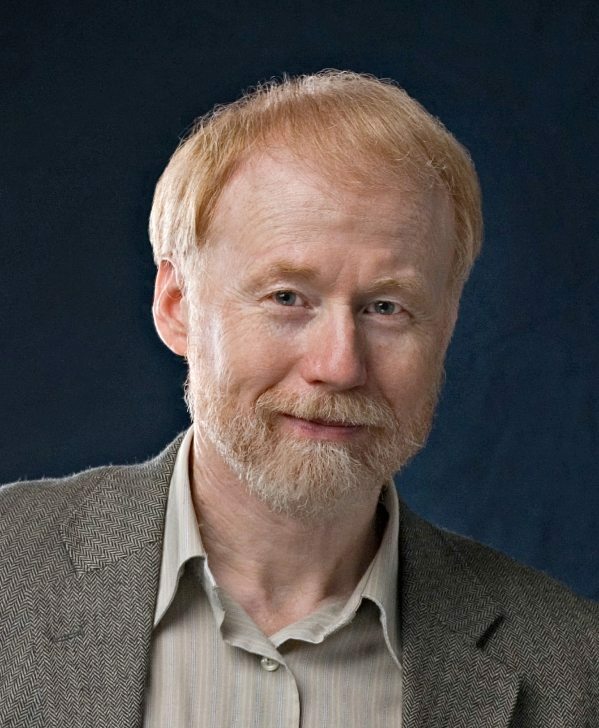 The creator of Embrace the Pun, Revenge of the Pun, The Pun Rides Again, and many other titles, his Ginger & Shadow collection Kitty Nirvana, has received an IPPY award. The unconventional artist/writer teaches cartooning courses at colleges in the Boston area while finding different ways to make the public laugh. IM: Hi, Barry! Welcome to Indyfest Magazine. Could you tell us a little about yourself? BC: I graduated from art school in the late 70s, working for ten years in graphic design before starting my own business. 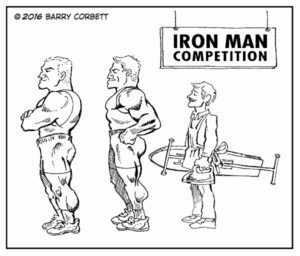 About that same time, I started creating comic strips, eventually teaming up with my cousin and fellow cartoonist Brian Codagnone to form Corbett Features. We’ve done print and web comics, humor columns, and panel cartoons. I focused my energies on the panel cartoons with some success, having been published in Reader’s Digest, Prospect Magazine, Barron’s, American Legion, First Magazine, True West, Fantasy & Science Fiction, Christianity Today, Lacrosse Magazine, and many others. I’ve recently introduced an autobiographical comic book series. IM: When did you realize there was a talent for cartooning in you? BC: I was drawing at five, but the first time I remember drawing attention was middle school, as the kids passed around my unkindly caricatures of certain teachers. As far as the double entendres, I think I was inspired early on by those atrocious puns in Rocky & Bullwinkle. IM: How did the years as a graphic artist influence your work? BC: The panel cartoon is an exercise in graphic design. A skilled cartoonist needs to boil down the essence of the image in order to convey his or her message without any extraneous information. Designing a logo requires a similar thought process. Your goal is to make that icon as simple as possible, a symbol that can be recognized instantly and forever associated with your product. Having the graphics background and an understanding of the print industry is a huge advantage in putting together our own books. IM: You started your own business in 1985. What did it concentrate on? Did you also work on your own artwork? BC: Like so many cartoonists leaving art school, I wanted to make a decent living and was sidetracked, in a sense by graphic design. 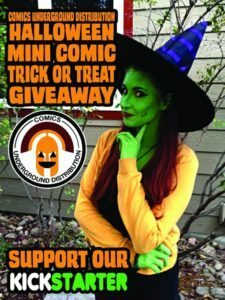 I did a lot of print work, logo design and trade show display. It was Superman that pulled me back to my roots. I read an article about DC rebranding the character, dropped into a comic store to check it out and was immediately hooked. As a kid, I had always read and drawn comics, but at this stage, I had not been drawing for 15 years. A month later I attended a comic-con in Boston and talked to a few of the artists. I sat down for a few minutes in the cafe, pulled out a marker and sketched on a napkin. That’s when it struck me­ —What have I been doing with my life? This is who I am! It’s so strange; Superman was the very first comic that I had discovered as a child, a cherished character that was instrumental in changing my career path. At that point, I began designing my own characters, working in graphics by day and drawing comics by night. My initial goal was to become a syndicated comic strip artist. IM: Working with family can be difficult; what made you want to work with your cousin? BC: Ha! Not at all. Comedy runs—no, it gallops though our family. We’d been writing jokes and passing ideas back and forth since we were kids. There were five working artists, including Brian’s Dad, in our immediate family. Every one of them warned us to stay out of the business! Brian, who joined forces with me to form Corbett Features, has a deep passion for comic strips. It was just a natural partnership. We work well together and trade barbs on a daily basis. IM: When did you start freelancing as a cartoonist? BC: My career has really been divided into three phases. Brian and I developed a number of comic strips and approached the major syndicates. Of course, they showed no interest. We felt that our work was polished and professional and we decided to self-syndicate. At this time the newspapers had not begun their long decline, so we were blindly optimistic. We mailed our samples to 400 editors without making a single sale. We were fairly discouraged at this point, when a call came in from The Globe & Mail out of Toronto, the largest newspaper in Canada. They wanted to run Brian’s feature, Misfits. That worked out great for eight months. We kicked it back into gear and sent out 500 more mailings. Alas, that’s when they all started dropping their comics section or closing down completely. Finally, the cartoon lettering was on the wall and we scaled back the comic strip promotion. We started the website in 2000 hoping to build our fan base. Between the two of us, we have a good variety of comic features. 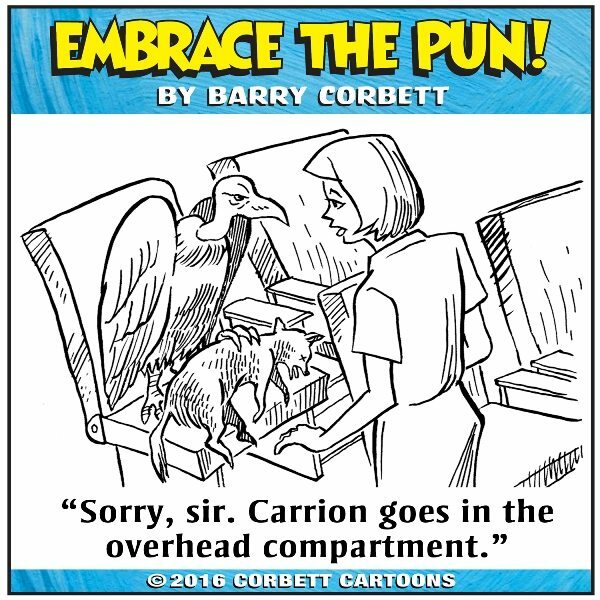 That’s when I developed my panel cartoon feature, Embrace the Pun, and approached the monthly print magazines. 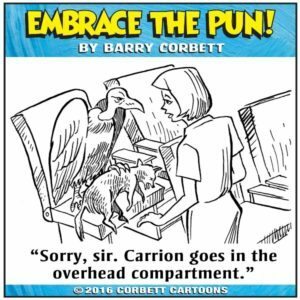 I compiled a mailing list and started sending two to three sets of cartoons out every week, beginning at the top paying markets, The New Yorker, Barron’s, or Reader’s Digest and working my way down the list to the smaller, local publications. All of the magazine cartoonists work this way. In a sense, you have to beat out 30 to 40 professional cartoonists every month in order to make a sale, so it’s an extremely competitive business. IM: What was the first cartoon you sold and how did that make you feel? 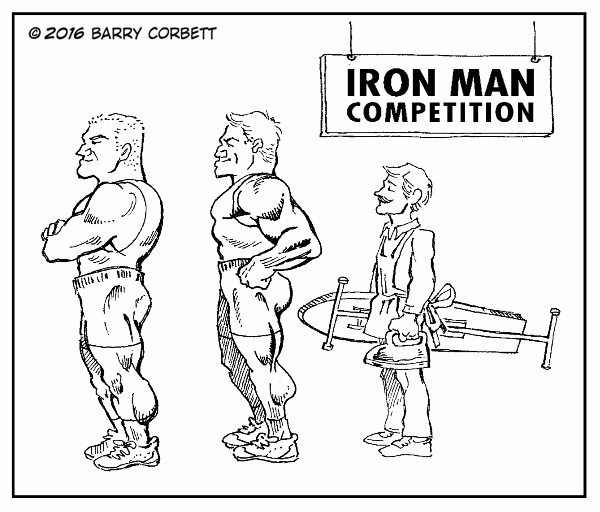 BC: It was one of the electronic trade magazines and they bought the Iron Man panel cartoon . I was thrilled, of course, because it was one of my favorite gags. They paid better than I had expected. IM: How did you come up with the pun books? BC: I just live for the opportunity to deliver a shameless pun. The sillier, the better. It was just a matter of merging those two dark skill sets. Often, these bizarre ideas will just pop into my head (people wonder why I’m chuckling to myself). You have to keep a notebook with you at all times—well, before we had smart phones, you had to. I can never remember the ideas if I don’t immediately jot them down. Somewhere out there in the ether are a thousand great jokes that were never drawn up in time. I swear, most of my ideas are gone within six minutes of conception. As you know, the business is all about handling rejection. Editors have their own peculiar sense of humor. A joke can be rejected for any number of reasons (other than not being funny); it may not be topical, it may be too wordy, it doesn’t appeal to the magazine’s target age, maybe it’s too obscure, too smart, too dumb, too detailed, or it may simply have already been done by somebody else. For every sale we make, we’ve drawn up 300 cartoons that are never published, never seen by anybody. That’s why I decided to put together the trade paperbacks. Share the pain, so to speak. IM: What as the driving force behind Ginger & Shadow? BC: The primary characters are based on our two real cats and their personalities are as different as night and day. As I’m writing this, Ginger is marching across my keyboard. They are the classic odd couple pairing. The strip practically writes itself. Shadow really is a nervous wreck, so intense that one of the vets wanted to put him on Prozac! Plus, cats sell. They really do. 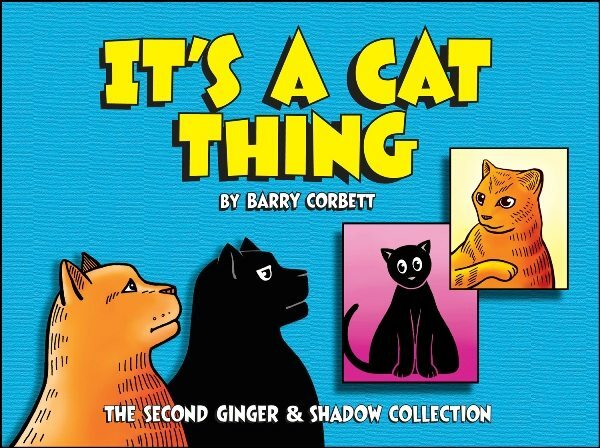 IM: What was the first thing you did when finding out that Ginger & Shadow won the first IPPY? BC: I ordered promotional stickers to put on the cover of Kitty Nirvana. Winning any kind of award is instant validation that somebody completely unbiased has enjoyed your work. It helps to draw readers to our table when we display our work at conventions. IM: With two IPPY’s under your belt, what is the next target you have in your sights? BC: Revenge of the Pun also won a Silver Medal in 2010 from ForeWord Magazine. I may enter the books in some international events. 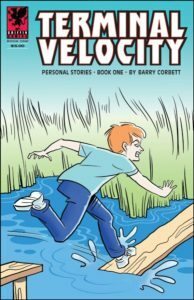 IM: Tell us about the journey you’re going through with Terminal Velocity. I’ve done some short story writing, mostly as a creative outlet. One of my friends told me that I’d had an interesting life and should write about it. I had always been a fan of autobiographical comics, having read Harvey Pekar, Art Spiegelman, R. Crumb, Adrian Tomine, Julie Doucet, and so many others. I decided to draw up some of the funnier moments from my past and see where it went. It began as single-page narratives, all of them humorous, but as it evolved, I started covering more serious material. We all have good stories to tell; we just need to bring them to light. I was a bit reckless in my youth, played a lot of ice hockey, did some scuba diving and, for five years, was a skydiver. Terminal Velocity is the maximum speed achieved by a falling body, or rather a skydiver in freefall. Well, I wasn’t very good at it. I somehow managed to land my parachute in every pine tree, telephone pole, junkyard, or apple orchard I could find. I even took down the Drop Zone’s receiving antenna while landing on the roof of the owners’ brand new car. Nothing to see here, folks! Along the way there was no shortage of inspiration, plenty of bad decisions, some crazy jobs, unusual teachers, odd relationships, and even some violence. I lost two brothers, attended art school, went through psychoanalysis (well, you’ve got to get your head examined when you jump out of airplanes), started three different businesses, married, and together with my wife, we raised a family. I guess my friend was right, but we all have personal stories to offer. I tried to find the humor in almost every situation and I hope that comes through in the comic. Book One is up for sale at IndyPlanet and Book Two will be released in October. I plan to collect the first four issues into a single narrative for the brick-and-mortar outlets. IM: What do you see in the future for your artistic outlet? BC: I plan to concentrate on the autobiographical work since the market for panel cartoons has dwindled. In its heyday, there were 20 to 30 magazines buying cartoons every month, but now there can’t be more than 12. They are dropping like flies, but comic book and graphic novel sales are stronger than ever. Of course, we’re all learning to navigate the digital market. That’s a topic on its own. IM: It’s always important that your partner support your endeavors. What did your partner say when you decided to strike out on your own? BC: She’s always been supportive, but I had to be realistic and make a very gradual transition to cartooning. There was no way I could have abandoned the graphics business while we were paying off a mortgage and raising two children. It’s only now that we feel financially secure enough to jump into this on a full-time basis. IM: Since Ginger & Shadow is based on your pets, do you see an end to that series? BC: Yes, I do see it ending at some point. I have plenty of ideas for plotlines but I know that I’ll grow tired of it and move on to something else. I think that all creative concepts have a natural lifespan. I really admired Bill Watterson for leaving Calvin and Hobbes at the peak of its popularity. One of the problems young creators have breaking into the syndicated market is the longevity of existing characters. Some of them ran for 70 years or more. Newspapers are still running Peanuts 16 years after the death of Charles Schulz, and it’s not uncommon for syndicates to hand the reigns to another illustrator when the original creator retires (not that I would turn that job down, mind you). IM: We want people to be able to find you online. Could you please let us know how you can be contacted? 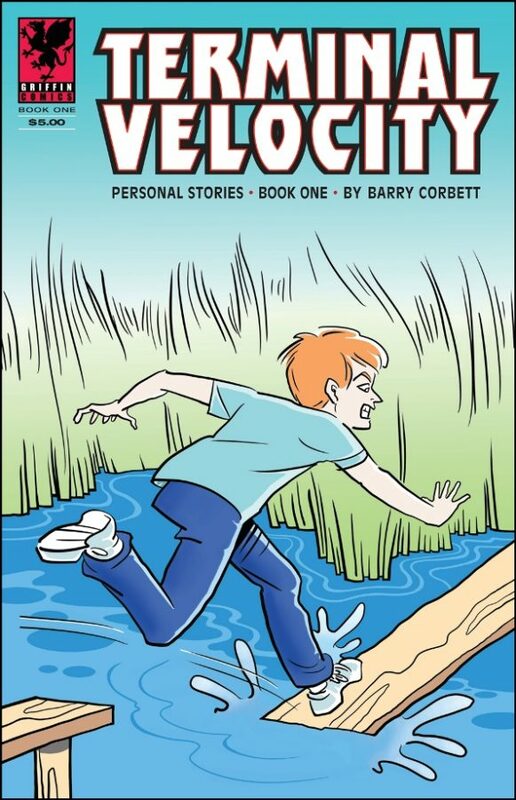 BC: Readers can look me up on Instagram (barrycorbett), bookmark my blog, https://barrycorbett.me , purchase Terminal Velocity at IndyPlanet, http://bit.ly/1nY1ZWk, and find new work from both Brian Codagnone and myself at Corbett Features http://www.corbettfeatures.com . All of our trade paperbacks are available through Amazon. IM: Barry, we would like to thank you for taking the time out of your busy schedule in order to take part in this interview. BC: My pleasure. It’s been fun (and it’s not as busy as you’d think). I always enjoy IndyFest Magazine and appreciate the opportunity to get the word out there. This entry was posted in 97 and tagged Barry Corbett, Brian Codagnone, Doug Owen on September 19, 2016 by aipman1.